My hair dryer has been broken for a week, thus leaving me to air drying and some help from the curling iron. But that doesn’t mean I’ve completely let any attempt at appearing pulled together fall by the wayside. One of my easiest tricks for not appearing one pair of mismatched shoes away from losing it, is a quick mani- pedi. I’ve mentioned before, it is seriously a great perk to living in this city that this luxury can be found for less than lunch (the mani at least). I officially took my nails into autumn territory during this first week of the season with Pamplona Purple, a fun shade that mixes plum and magenta. However, I’m becoming increasingly intrigued by the modest to outrageous nail art I’ve been seeing. During high school, inch long acrylic nails were a regular occurrence, and the glitter stripped, white tips are etched in my mind as the epitome of cheap (border line gross) beauty trends. Thankfully, I’m now seeing everything from herringbone checks to the new magnetic nail polish on short (hygenic) real nails. I haven’t yet done anything more exciting than a glitter top coat, but am anxious to try a fun pattern. Have you sported any nail art? Thank you everyone for all of the wonderful comments on yesterday’s Style Snapshot! While yesterday’s interview touched on the complications of work clothes, this NYC heat wave has ushered in a ‘work hair’ issue. Professional hair to many means pulling it up. On the same lines as work clothes, I feel it is crucial to feel as authentic as you do professional, and obviously fabulous, everyday. 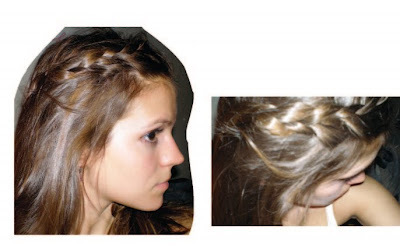 I have had long, thick hair since college, and worked my own professional ‘do through the cool months with a messy Lauren Conrad-esque braid. The look received multiple rave reviews, even though it is insanely easy. Now that the mercury is edging around 100, any hair touching my neck will cause a fit. This Jessica Alba look is amazing, but a little complicated. I am going to try to work my braid into a loose “professional” chignon, what’s your work hair style? 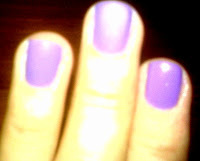 When my mom was visiting this weekend we had every intention of getting much needed manicures and pedicures. Unfortunately we got swept up in NYC activities and nail maintenance fell by the wayside. Her next stop was seeing her own mother, and they got mother daughter mani pedis on Sunday. My mom sent me this blackberry photo after they finished, and not only did I miss her but I was entirely jealous! She dipped into the OPI Shrek Forever After Collection with Funky Donkey. Although the collection has cute character inspired names, the colors are rich and saturated, definitely fit for a princess….or ogre. Last Saturday I zeroed in on the most outrageous shade I could find at the manicure shop.It turned out to be Essie’s Turquoise and Caicos from their 2010 Summer Resort Collection. I have literally gotten compliments everyday from anyone glancing at my hands, and all day typing I get a little giggle from my aqua nails.